And how shall we use this comforting condiment? Well, as I mentioned in the video, you can use it for baking or for fresh eating. I, personally, like to slather it thickly on this quick-and-delicious Irish Soda Sandwich Bread (recipe here). 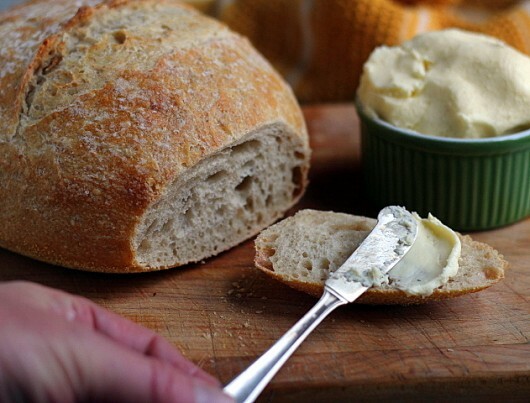 Think you’ll whip up a batch of this beautiful buttah? You can let me know by posting a comment below. Your words are the sunshine of my day. And frankly, I could use some sunshine right about now. We’re due for another snow storm! I used to make butter when I taught pre-K Sunday school. Just a cup or so of cream in a mason jar that everyone got to shake. They loved it. Thanks for the butter how-to. I always made it in a jar but this method is great too! I add nasturtium flowers to my butter in summer, then make molds of it to give away to family and friends. I just use chocolate molds. I can’t believe you made butter! Can’t wait to try it. And now I won’t have to buy that expensive french stuff at Guido’s. Thanks! Thank you for the delightful video. I have tried making butter several times, but the butter would get moldy in a few days no matter how much I squeezed out the liquid. Any tips on keeping the butter from getting moldy besides using it up quickly? Is there a reason not to add the salt while processing the cream? Seems like it would be easier. I will definitely make the butter and add the dried herbs from last year’s garden. How long will the butter keep in the refrig? Thank you again for all your fabulous recipes and I love, love your cookbook!!! Sure, I’ll try it. Looks great and simple, too. Thanks, Kevin. In my whole life, I’ve never made butter! Now I will. 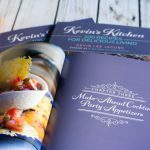 Kevin, thank you so much for all of your expertise, cooking tips and creativity in the kitchen! You inspire us to try new and different things we would never have thought about attempting without your inspiration! I love it! Also, how is your kitchen remodeling coming? Have you given any further thought about considering double door ovens with hinged doors rather than the regular doors that flip down? I can’t wait to do this. We did this in Girl Scouts so many years ago, I forgot about it. More recently I have used the food processor add garlic, herbs, honey, or leftover cranberry sauce to butter I purchase from the store. How much better to make my own butter and then make the additions! Thanks for the recipe and video. I liked seeing the various stages it goes through…I wonder too about how long it will keep? I’m looking forward to making it. It looks easy and delicious! I’ve never made homemade butter before! Can’t wait! (And I have the exact same food processor as yours! I love mine.) Thanks for this video!!! Since you’re removing the buttermilk fats, would this be like clarified butter? Or would I need to take the normal steps for clarified butter (heating it, etc)? Kevin! Thank you for this quick tutorial on making butter. It literally took me 15 minutes, start to finish. This included collecting some rosemary from the garden, grinding it, and the entire cleanup on into the dw. Done! I only wish I had grass-fed cream available at our local corner market. A reminder of how taking just an extra moment or two makes things just that much more beautiful and delicious. Will try this today as I have some leftover heavy cream. Didn’t realize how simple it is to make. I now know how to make really good butter. Thank you!!! The idea to use herbs from the garden had given me lots of ideas for this summer. Hi Christine – Better to add salt at the end so it isn’t rinsed away. I’ve never tried to make butter in a stand mixer, but if you do, let me know how the process works out for you! Used to, used to and now, will again. Thanks for pushing me! Please respond to Margaret’s #4 comment about how long it will keep and how to prevent mold. Is the mold of the penicillin strain? if so, is it harmless to eat if it happens to be ingested??? Hi Michelle – So glad you tried — and liked — the butter. Rosemary addition sounds divine! Hi Margaret and Ellen — Speaking from experience, if you knead a little salt into the butter (as I did in the video), the butter will keep for at least 7 days. Just be sure to cover and refrigerate it! For longer storage, freeze the butter. I never would have imagined butter would be easy to make ,or so delicious. We had company coming for dinner last evening,so I decided to make some butter to go along with my warm homemade dinner rolls. I added some honey also. It was fabulous . Thank you again for yet another great idea. Hi Venessa – I’m so glad the butter worked out well for you. Warm homemade dinner rolls: YUM. I never knew you could make “buttah” so easily and quickly in a food processor. So much great info in this video, thanks Kevin. I want to make some yummy herb butter, and also cinnamon and sugar butter. Our Sunday morning starts with, “Did you read ‘Garden for the House’?” And then we discuss and plan to try the ideas. LOVE the butter recipe!!! With butter $4.00 a pound, it’s almost an economy! Hi Julie – Glad you liked the video. Homemade butter is addicting! Hi Cary – So happy you’ve found useful information on this blog. Enjoy the buttah! Kevin, can I use a blender to make butter in place of a processor?